The Budget SLP: My Favorite Pin! It's been just over a year since I started using became addicted to Pinterest. My closets and cabinets are better organized, I now use mason jars for a number of storage solutions, and I have purchased the paint for my next furniture project. Before searching Google for home and work ideas, I search Pinterest. And, when searching a topic for this blog, I search Pinterest first! My absolutely favorite pin is pictured below. 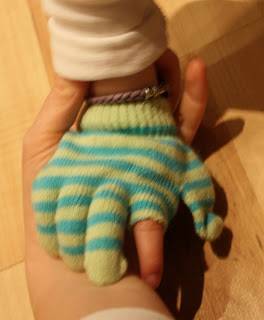 Dana Nieder, author of the blog Uncommon Sense, put a glove, minus the index finger, on her daughter's hand so that desired buttons on the iPad could be pushed without accidentally pushing other portions of the screen. Last week, I saw this work beautifully in a preschool class. The glove was too large for the student so the teacher taped the fingers down and the child, who could only randomly activate actions by swiping, purposefully pushed buttons to see favorite TV characters. What is your favorite pin?